Domateste kök ur nematodlarına karşı dayanıklılık sağlayan Mi-1geni 28ºC’nin üzerindeki toprak sıcaklılarında kırılmaktadır. Bu durumu anlamak için Meloidogyne incognita (Kofoid & White, 1919) Chitwood, 1949’ ya hassas ve dayanıklı bitkiler, dört toprak sıcaklığında (25, 28, 30 ve 32ºC) ve 6 sürede (6, 12, 24, 48, 120 ve 168 saat) ayrı ayrı incelenmiştir. Bu çalışma 2015 ve 2016 yılları arasında iklim odalarında yürütülmüştür. İlk denemede bitkiler nematod inokulasyonundan önce aynı altı zaman periyodu için 25, 28, 30 ve 32ºC toprak sıcaklıklarına maruz bırakılmış, daha sonra 25ºC’deki iklim odasına aktarılmıştır. Nematodların üreme faktörü (Rf) dayanıklı bitkilerde 1’den büyük hassas bitkilerde ise 1’den küçük bulunmuştur. İlk denemenin sonucu, Mi-1tarafından sağlanan dayanıklılığın belirtilen toprak sıcaklıklarında kırılmadığını göstermiştir. İkinci denemede toprak sıcaklıkları 25ºC, 28ºC, 30ºC ve 32ºC’ye ulaştığında eş zamanlı olarak M. incognitainokulasyonu yapılmış ve adı geçen sürelerde toprak sıcaklığına maruz bırakılmıştır. Daha sonra bitkiler 25ºC toprak sıcaklığına sahip iklim odasına aktarılmıştır. 32ºC toprak sıcaklığına, 48 saat ve üzerinde maruz bırakılan heterozigot dayanıklı bitkilerde Rf değeri >1 olarak bulunmuştur. Bu sonuçlar 32ºC toprak sıcaklığına, 48 saat ve üzeri maruz bırakılan bitkilerdeki dayanıklılığın etkisini yitirdiğini göstermiştir. The Mi-1 gene conferring resistance to root-knot nematodes in tomato breaks down at soil temperatures above 28ºC. To understand this phenomenon, the reactions of susceptible and resistant tomatoes toMeloidogyne incognita(Kofoid & White, 1919) Chitwood, 1949 were separately investigated under four soil temperatures, 25, 28, 30 and 32ºC, and at six time periods, 6, 12, 24, 48, 120 and 168 h. The study was conducted between 2015 and 2016 in growth chambers. In the first experiment, the plants were separately exposed to soil temperatures for the same six periods before nematode inoculation and then transferred to a growth chamber with 25ºC. Reproduction factor (Rf) for nematode on resistant plants was <1, while the Rf for susceptible plants was >1. Results indicated that the resistance provided by Mi-1persisted under all soil temperatures. In the second experiment, the seedlings were simultaneously inoculated with M. incognita when soil temperatures reached 25, 28, 30 and 32ºC, and held in soil temperatures for the same six periods, then transferred to a growth chamber with 25ºC soil temperature. Rf in heterozygous resistant plants exposed to 32ºC soil temperature for ≥48 h was >1. This study indicated that the resistance in plants held at 32ºC soil temperature for ≥48 h lost its effect. Abdul-Baki, A. A., S. A. Haroon & D. J. Chitwood, 1996. Temperature effects on resistance to Meloidogyne spp. in excised tomato roots. Horticultural Science, 31: 147-149. Al-Hazmi, A. S. & S. N. Al-Nadary, 2015. Interaction between Meloidogyne incognita & Rhizoctonia solani on green beans. Saudi Journal of Biological Sciences, 22: 570-574. Ammati, M., I. J. Thomason & H. E. McKiney, 1986. Retention of resistance to Meloidogyne incognita in Lycopersicon genotypes at high soil temperature. Journal of Nematology, 18: 491-495. Arab, L. & S. Steck, 2000. Lycopene and cardiovascular disease. The American Journal of Clinical Nutrition, 71: 1691-1695. Araujo, M. T., M. J. Bassett, J. J. Augustine & D. W. Dickson, 1982a. Effects of the temperature and duration of the initial incubation period on resistance to Meloidogyne incognita in tomato. Journal of Nematology, 14: 411-413. Araujo, M. T., D. W. Dickson, J. J. Augustine & M. J. Bassett, 1982b. Optimum initial inoculum levels for evaluation of resistance in tomato to Meloidogyne spp. at two different soil temperatures. Journal of Nematology, 14: 536-540. Carvalho, M. D., L. Bendand, M. M. Vaughan, A. R. Cabrera, K. Hung, T. Cox, Z. Abdo, L. H. Allen & P. E. A. Teal, 2015. Mi-1 mediated nematode resistance in tomatoes is broken by short-term heat stress but recovers over time. Journal of Nematology, 47: 133-140. Clinton, S. K., C. Emenhiser, S. J. Schwartz, D. G. Bostwick, A. W. Williams, B. J. Moore & J. W. Erdman, 1996. Cis-trans lycopene isomers, carotenoids, and retinol in the human prostate. Cancer Epidemiology and Prevention Biomarkers, 5: 823-833. Cortada, L., F. J. Sorribas, C. Ornat, I. Kaloshian & S. Verdejo-Lucas, 2008. Variability in infection and reproduction of Meloidogyne javanica on tomato rootstocks with the Mi resistance gene. Plant Pathology, 57: 1125-1135. Devran, Z., B. Başköylü, A. Taner & F. Doğan, 2013. Comparison of PCR-based molecular markers for identification of Mi gene. Acta Agriculturae Scandinavica, Section B - Soil and Plant Science, 45: 395-402. Devran, Z. & M. A. Söğüt, 2009. Distribution and identification of root-knot nematodes from Turkey. Journal of Nematology, 41: 128-133. Devran, Z. & M. A. Söğüt, 2010. Occurrence of virulent root-knot nematode populations on tomatoes bearing the Mi gene in protected vegetable-growing areas of Turkey. Phytoparasitica, 38: 245-251. Devran, Z., M. A. Söğüt & N. Mutlu, 2010. Response of tomato rootstocks with the Mi resistance gene to Meloidogyne incognita race 2 at different soil temperatures. Phytopathologia Mediterranea, 49: 11-17. Devran, Z. & M. A. Söğüt, 2011. Characterizing races of Meloidogyne incognita, M. javanica and M. arenaria in the West Mediterranean region of Turkey. Crop Protection, 30: 451-455. Devran, Z. & M. A. Söğüt, 2014. Response of heat-stable tomato genotypes to Mi-1 virulent root-knot nematode populations. Turkish Journal of Entomology, 38: 229-238. Devran, Z., M. A. Söğüt, U. Gözel, M. Tör & I. H. Elekcioglu, 2008. Analysis of genetic variation between populations of Meloidogyne spp. from Turkey. Russian Journal of Nematology, 16: 143-149. Dropkin, V. H., 1969a. Cellular responses of plants to nematode infections. Annual Review of Phytopathology, 7: 101-122. Dropkin, V. H., 1969b. The necrotic reaction of tomatoes and other hosts resistant to Meloidogyne: Reversal by temperature. Phytopathology, 59: 1632-1637. Duncan, L. W. & J. W. Noling, 1998. “Agricultural Sustainability and Nematode Integrated Pest Management, 251-287”. In: Plant Nematode Interactions (Eds. K. R. Barker, G. A. Pederson & G. L. Windham), Madison: American Society of Agronomy, 771 pp. FAO, 2014. Production quantities of tomatoes in world. (Web page: http://www.fao.org/faostat/en/#data/QC/visualize) (Date accessed: 20 April 2017). Ferris, H., 1985. Density-dependent nematode seasonal multiplication rates and overwinter survivorship: A critical point model. Journal of Nematology, 17: 93-100. Haroon, S. A., A. A. Baki & R. N. Huettel, 1993. An in vitro test for temperature sensitivity and resistance to Meloidogyne incognita in tomato. Journal of Nematology 25: 83-88. Hooper, D. J., 1986. “Extraction of Free-Living Stages from Soil, 5-30”. In: Laboratory Methods for Work with Plant and Soil Nematodes (Ed. J. F. Southey). Her Majesty's Stationery Office, London, 202 pp. Hussey, R. S., 1985. “Host Parasite Relationship and Associated Physiological Changes, 143-153”. In: An Advanced Treatise on Meloidogyne Vol. I. Biology and Control (Eds. J. N. Sasser & C. C. Carter). Raleigh, North Carolina State University Graphics, 422 pp. Lobna, H., R. Hajer, M. B. Naima & H. R. Najet, 2016. Studies on disease complex incidence of Meloidogyne javanica and Fusarium oxysporum f.sp. lycopersici on resistant and susceptible tomato cultivars. Journal of Agricultural Science and Food Technology, 2: 41-48. Manzanilla-López, R. H. & J. L. Starr, 2009. “Interactions with Other Pathogens, 223-245”. In: Root-knot Nematodes (Eds. R. N. Pery, M. Moens & J. L. Starr). Wallingford, CAB International, 531 pp. Mıstanoğlu, I., T. Özalp & Z. Devran, 2016. Response of tomato seedlings with different number of true leaves to Meloidogyne incognita Kofoid and White, 1919 Chitwood, 1949. 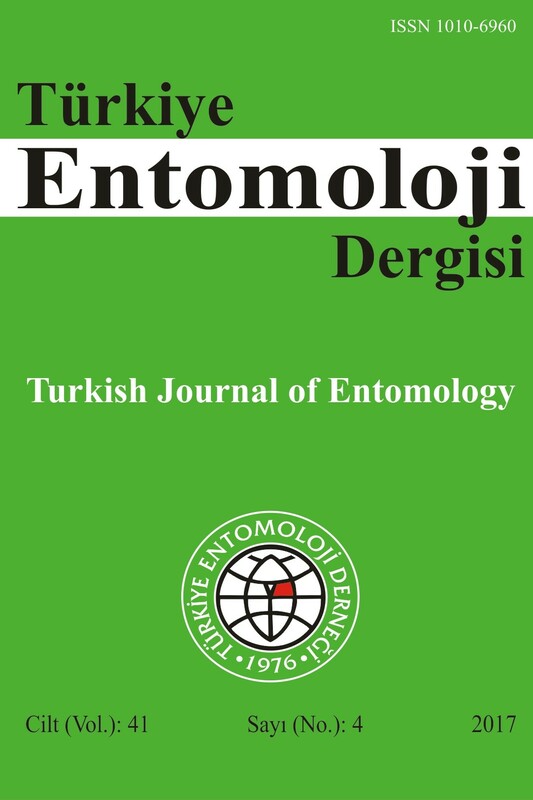 Turkish Journal of Entomology, 40: 377-383. Moens, M., R. N. Perry & J. L. Starr, 2009. “Meloidogyne Species a Diverse Group of Novel and Important Plant Parasites,1-17”. In: Root- Knot Nematodes (Eds. R. N. Perry, M. Moens & J. L. Starr). CABI, London, 488 pp. Nombela, G., V. M. Williamson & M. Muniz, 2003. The root-knot nematode resistance gene Mi.1.2 of tomato irresponsible for resistance against the whitefly Bemisia tabaci. Molecular Plant-Microbe Interactions, 16: 645-649. Randig, O., M. Bongiovanni, R. M. Carneiro & P. Castagnone-Sereno, 2002. Genetic diversity of root-knot nematodes from Brazil and development of SCAR marker specific for the coffee damaging species. Genome, 45: 862-870. Roberts, P. A. & I. J. Thomason, 1986. Variability in reproduction of isolates of Meloidogyne incognita and M. javanica on resistant tomato genotypes. Plant Disease, 70. 547-51. Rossi, M., F. L. Goggin, S. B. Milligan, I. Kaloshian, D. E. Ullman & V. M. Williamson, 1998. The nematode resistance gene Mi of tomato confers resistance against the potato aphid. Proceedings of the National Academy of Sciences, 95: 9750-9754. Seah, S., V. M. Williamson, B. E. Garcia, L. Mejia, M. S. Salus, C. T. Martin & D. P. Maxwell, 2007. Evaluation of a codominant SCAR marker for detection of the Mi-1 locus for resistance to root-knot nematode in tomato germplasm. Tomato Genetics Cooperative Report, 57: 37-40. Seid, A., C. Fininsa, T. Mekete, W. Decraemer & W. M. Wesemael, 2015. Tomato Solanum lycopersicum and root-knot nematodes Meloidogyne spp. -a century-old battle. Nematology, 17 (9): 995-1009. Siddiqi, M. R., 2000. Tylenchida, Parasites of Plants and Insects. 2nd Edition. Wallingford, CABI Publishing, CABI International, 805 pp. Siddiqui, Z. A., M. Shehzad & S. Alam, 2014. Interactions of Ralstonia solanacearum and Pectobacterium carotovorum with Meloidogyne incognita on potato. Archives of Phytopathology and Plant Protection, 47: 449-455. Smith, P. G., 1944. Embryo culture of a tomato species hybrid. Proceedings of the American Society for Horticultural Science, 44: 413-416. Starr, J. L., M. J. Jeger, R. D. Martyn & K. Schilling, 1989. Effects of Meloidogyne incognita and Fusarium oxysporum f. sp. vasinfectum on plant mortality and yield of cotton. Phytopathology, 79: 640-646. Taylor, A. L. & J. N. Sasser, 1978. Biology, Identification and Control of Root-Knot Nematodes. Raleigh, North Carolina State University Graphics, 111 pp. Zacheo, G., T. Bleve-Zacheo, D. Pacoda, C. Orlando & R. D. Durbin, 1995. The association between heat-induced susceptibility of tomato to Meloidogyne incognita and peroxidase activity. Physiological and Molecular Plant Pathology, 46: 491-507.